Thomas Perez once pushed for a domestic workers’ bill of rights. Could he help the movement at the federal level? 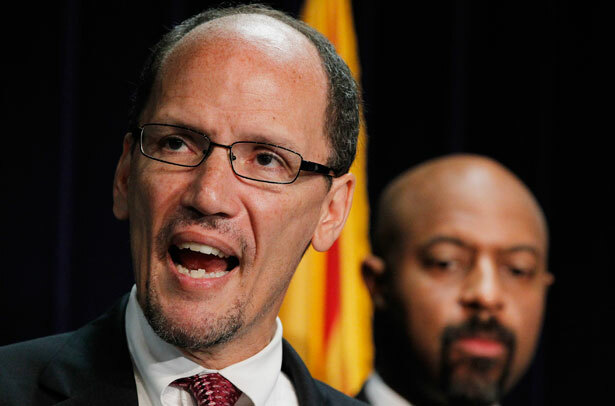 Word is out that President Obama will nominate Thomas Perez to head the Department of Labor today, the current assistant attorney general for civil rights. Perez has some bona fide progressive credentials, having cracked down on voting restrictions, police brutality, harassment against LGBT students and other issues at the Department of Justice, plus bringing a history of promoting immigration reform and labor rights. But one part of his history should give domestic workers heart and may take on even more meaning if he assumes this new role. In the early 2000s, Perez ran for Maryland’s Montgomery County Council and won, becoming the second person of color to ever be elected to that body. While there, one issue he pushed was a domestic workers bill of rights. While it didn’t pass until after he had left the council, the bill now requires those who employ domestic workers to care for their children to give workers a written contract that spells out wages and benefits and to obtain a written statement if a worker declines this offer, to provide live-in help with a separate room that has a lock to sleep in and to ensure “reasonable access” to a bathroom, the kitchen and laundry. The original bill had included a minimum wage of $10.50 an hour and mandatory paid vacation and health insurance, but these provisions were ultimately stripped from the bill. While in theory the country’s domestic workers are entitled to minimum wage and overtime, most don’t know of these rights and few can access them. State-level bills therefore help codify these rights while guaranteeing others, crucially important in an industry that is not able to organize the way others can. New York’s bill has been on the books for more than two years and other states have introduced similar legislation, with a bill that California Governor Jerry Brown shot down last year just recently reintroduced. The movement to achieve better labor protection for this industry has some serious momentum, but it is still happening in a patchwork way at the state level. Meanwhile, home health aides are on the brink of getting good news from the Department of Labor that they will finally be protected by national labor laws. They’ve been excluded from minimum wage and overtime laws, but a department rule change could finally grant them these protections enjoyed by almost all other workers. This is a crucial place to shine a labor protection spotlight. Domestic workers and home health aides work in rapidly growing industries—home health aide is the fastest-growing job in America. Yet they fall outside of many labor protection regulations and often suffer abuse and poor working conditions, not to mention incredibly low pay and few, if any, benefits. Even with the federal rule change and state-level bills, there is a long way to go before we can ensure that these workers are valued and rewarded for the crucial work that they perform. These workers could use a friend at the Department of Labor when they bring lawsuits or put forward legislation. Dare we hope that we might see even more federal protections extended to them, like a $10 minimum wage? Perez’s history of supporting domestic workers’ rights, not to mention immigration reform that could benefit the industry’s huge population of immigrants, could bring attention and action to the movement at a crucial time. Hospital workers in Olympa, Washington, are on strike for affordable healthcare. Read Greg Kaufmann’s report.